In 2009 I was commisioned with Marco Barsottini by INFN (the Italian National Institute of Nuclear Physics) to design two installations and an exhibit for a big exhibition in Rome. The show named "Astri e Particelle" ( "Stars and Particles") took place in a prestigious venue such as Palazzo delle Esposizioni then it moves to another important venue as Citta della Scienza of Naples; both exhibitions were visited by over 180.000 people. 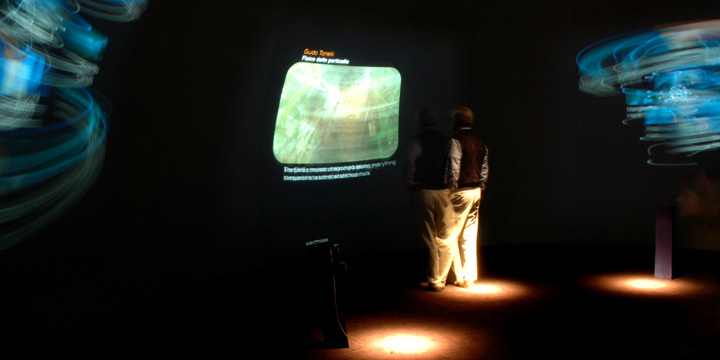 First installation was aimed at displaying the physicists community by many interviews, in this perspective we had two project constrains: using heterogeneous (for quality and styles) video contributions and placing the work inside a big spherical cap. We decide to organize interviews in four interactive floating structures projected on the dome interior, transforming audiovisual contributions in graphical objects to preserve aesthetic coherence. 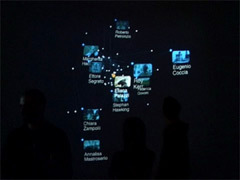 Visitors were able to interact with these networks with rotary sensors mounted on small stands; selecting a node let the system to play a close-up video. The rotation made structures virtually modulating a sound on a specific frequency, each pitch was tuned in harmonic relationship with others. 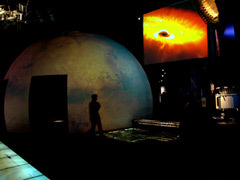 We used video mapping projection of celestial bodies texture on the dome exterior. 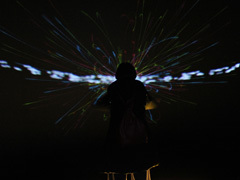 The second project was an interactive representation of space-time distortion concept. On a expressly prepared transparent surface a reactive bidimensional grid was projected, a camera detected user bodies, the system used these data to simulate gravitational fields on the grid. Last work was an exhibit designed to communicate universe and timespace expansion, museum visitors could interact with the system through a couple of proximity sensors, the users were free to explore this idealized model (virtually) moving on the time axis. All software developed in C++ with openframework. In 2010 another interactive exhibit - to communicate the theme of particle accelerator with youngest audience - were commisioned by INFN for Invisibile Meraviglia exhibition at Museo Regionale di Scienze Naturali in Turin. Photo documentation at "L'Energia del vuoto" 2013, Bologna.